There is no shortage of auto lenders out for your business, but many claim to be the best, but in reality they can't hang with the rest. There are many places to start you're shopping for the lowest loan rates and you could look to a local bank, credit union, the car dealership or find plenty of sources online. What I've tried to do is make your search for the best auto loan rates and terms as easy as possible by creating the auto lenders review (just below) of some of the nations top auto lenders and my favorite online choice. Spoiler Alert - To Save you some time I've decided to share my "Editors Top Choice" here at the beginning as opposed to you having to read the whole page. Buyer Beware! Car dealerships make big finance profits when they arrange auto loans for customers, so it is definitely worth a short amount of time to look over my auto lenders review before you sign any 4, 5, or 6 year "legally binding" contracts at the dealership. auto lenders offer the best auto loans for you! Here are some of the nations top auto lenders, some of their auto loan guidelines and their credit criteria. Knowing this can save you from unnecessary credit inquiries and from wasting your time if they don't offer a program that fits your needs. Follow any one of the lenders links to learn more about their programs. If you feel that you may not qualify for these lenders programs please take a look at my Bad Credit Loans page. Before you begin, please read my quick disclaimer. For A+, A, B and upper level C tier credit. Minimum credit score of 620 required for auto loans. Minimum 5 year credit file and 3 satisfactory trades. Excellent rates for new and/or near new vehicles. Decent rates for older used vehicles. Up to 75 month financing. Maximum advance of 110% of wholesale/invoice, plus TT&L and back end products. Vehicles must be 5 years old or newer. For A+, A, B, C and upper level D tier credit. Minimum credit score of 520 required for auto loans. Minimum 7 year credit file and 3 satisfactory trades. Very competitive rates for new and/or near new vehicles. Up to 72 month financing. Maximum advance of 115% of wholesale/invoice, including TT&L, plus back end products. Maximum advance is restricted for certain trucks and SUV's. Prime rates are only available for direct lending. No longer offer private party, motorcycle or lease buyout loans. Vehicles must be 7 years old or newer. Maximum of 70,000 miles for direct lending. Maximum of 80,000 miles for indirect lending. For A+, A, B, C tier credit. Minimum credit score of 520 required for auto loans. Offers business loans without guarantor. Competitive rates for new vehicles. Not very competitive rates for older used vehicles. Maximum advance of 135% of wholesale/invoice, including TT&L and back end products. No age or mileage restrictions stated, but shorter finance term and limited advance may apply. For A+, A, B and select C tier credit. Minimum credit score of 580 required for a loan. First time buyer program available. Decent rates for new and/or near new vehicles. Very competitive rates for older used vehicles. Up to an 84 month loan. Maximum advance of 100% of retail/MSRP, plus TT&L and back end products. Minimum credit score of 540 required for auto loans. Offers business loans Loan Competitive rates for new and/or near new vehicles. Good rates for older used vehicles. Maximum advance of 90-130% of wholesale/invoice, including TT&L and back end products. Maximum advance is restricted for certain trucks, SUV's and Vans. For A+, A, B tier credit. Minimum credit score of 690 required for auto loans. Minimum 5 year credit file. Loan program not available in all states. Excellent rates for older used vehicles. Maximum advance of 105% of retail/MSRP, plus TT&L and back end products. Luxury discount of .10% for amount financed >$35,000. Equity discount up to .80%. 48 month, or less, short term discount of .25%. Minimum credit score of 625 required for auto loans. AZ, NM, NV, UT only. A tier rates offered at 675 score and up. Competitive rates for new and/or near new vehicles. Maximum advance of 100% (used vehicles) of retail/MSRP, plus TT&L and back end products. Maximum advance of 110% (new vehicles) of invoice, plus TT&L and back end products. Vehicle must be 8 years old or newer. Minimum credit score of 650 required for auto loans. A tier rates offered at 700 score and up. 90 days to first payment available (top tiers only). Maximum advance of 105% (used vehicles) of retail/MSRP, including TT&L, plus back end products. Maximum advance of 95% (for full size trucks and SUV's) of retail/MSRP, including TT&L, plus back end products. Luxury discount of .10% for amounts financed >$30,000. There are six main credit tiers that most full spectrum lenders will use to determine the loan they are willing to approve for customers and what rates they will charge. Your FICO score / Beacon score is what most lenders use to determine the finance rate. Even though your credit score is used to determine your finance rate, it does not guarantee that your loan will be approved. Here is a quick breakdown of credit tiers defined by credit score. For a more complete analysis of credit tiers view my complete FICO Score and Credit Tier Breakdown. I've done research on past deals at the dealership I work for and have found that cash buyers save over $2000 per deal on average. It's more when you factor in the finance savings. 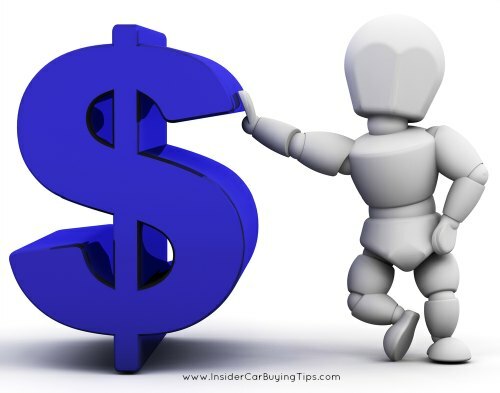 Buy like a cash buyer, focus on the sales price (not payments) and save big! Now's a good time to complete a quick, no obligation "Loan Application"
Getting pre-approved for auto loans is one of the key tips I share in my New and Used Car Buying Guide and it's worked to save thousands of visitors thousands of dollars.